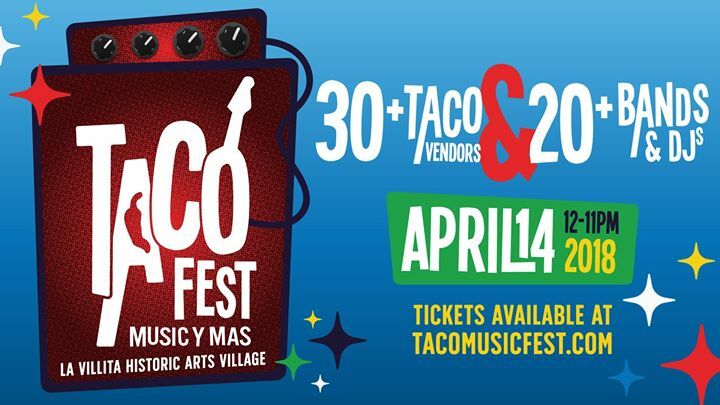 Taco Music Fest: Music y Más heats up San Antonio on Saturday, April 14, from noon - 11 p.m. in a unique South Texas food and music event. Set in the La Villita Historic Arts Village and adjacent streets, the inaugural festival features the wide variety of tacos that make San Antonio famous, from puffy, to foodie, to breakfast, to barbaco, all served with an eclectic musical lineup ranging from classic San Anto oldies to cutting-edge alt-Latino. Over 30 plus participating eateries will offer at least one $2 taco, along with sides and other menu items. Modelo USA Beer, Deep Eddy Vodka cocktails, wine, aguas frescas, and other non-alcoholic beverages will be available for sale. Participating restaurants include Viva Villa, Sancho’s, Chisme, Tommy's Restaurant, Soluna, Tomatillos Restaurant, Don Pedro Mexican Restaurant, Torchy's Tacos, El Milagrito Cafe, Garibaldi's Mexican Restaurant, La Casa De Barbacoa, Los Cocos Mexican Restaurant Seafood and Fruits, Mr. Meximum, Chela's Tacos -Alamo Heights and MARIOLI, with more confirmed daily. A uniquely San Antonio festival, Taco Fest will showcase more than 20 live bands and DJs, across three stages including La Santa Cecilia, Brownout Presents Brown Sabbath, Santiago Jimenez Jr., Girl in a Coma, Money Chicha, ECNO - El Conjunto Nueva Ola, Pinata Protest, Femina-X, Bombasta, Los #3 Dinners, Grupo Frackaso, Eddie & the Valiants, and more. Music, vendors and local artisans, interactive cooking demos, and children’s activities round out the downtown festival programming. "Taco Fest is a long overdue celebration of San Antonio's favorite food. From foodie tacos to classic breakfast tacos, we will showcase in one place the amazing diversity of tacos that make San Antonio famous,” says Taco Fest creative director, Jim Mendiola. Mendiola and his team have produced other local festivals like Día de los Muertos Fest, Maverick Music Festival, San Antonio Beer Festival and Texas Salsa Festival.